1) 2x mobs. All members must attack to damage the dark enemy. Earth one makes fire runes sticky. 4) Monochrome runes, spam trojan, if dark runes in initial dissolve it absorbs damage taken as HP. 5a) 50 fire rune cumulative shield (resets at CD 1), uncontrollable, each turn it converts fire runes into earth and makes them sticky. 5b) Becomes CD 1. Earth runes are weathered and do 15000 damage. Earth combo trojan. Uncontrollable. Most enemies are CD 1 with 13k+ attack and after the first stage there's limited breathing room to stall apart from the CD 2 spam trojan on stage 4. Even then most teams won't be able to last more than 4 turns. As usual, high HP and rec are a must. 1) You probably need to kill at least one of them before turn 6. 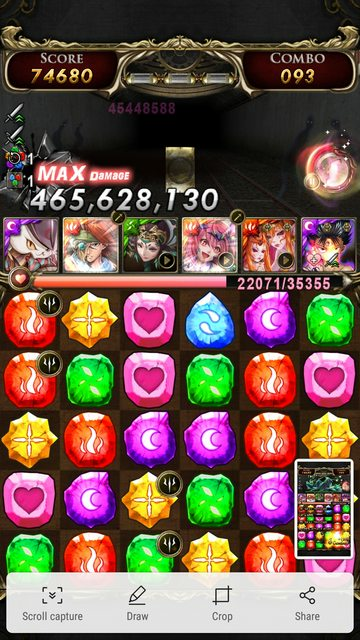 If you have a non-mono team you can stall as long as you want on the dark enemy by only dissolving one attribute of attacking runes. 3a) In theory you can keep stalling here if you have enough recovery, but it's trickier since you need to stack earth runes. You probably want to convert away the earth runes and move on. 3b) Unlock the board somehow (explosion, convert, DC) and burst it down. You won't be able to stay here for long since it's 17k CD 1 and you have no recovery. 5a) 50 fire rune shield. Seriously? Obviously this is tailored to convert + Natsu, 2x YZ or even a Hephaestus/Brahma/Ninurta team. It's 19k CD 1 so if you have enough HP and rec then in theory you can grind through (while waiting for skydrops if you don't have a converter), even with a non-fire team. It will be painful though. 5b) Convert away or stack earth runes and burst down. 2* Clear (Demon Leader and Ally, 3+ Attributes) with Dual Ying Zheng + Hiei, Samle, Y'golonac, filler demon. I brought Lancelot for skill grinding. 1, 2) Spin through, taking 5 turns. Turn on Lancelot or other enchantress whenever ready. 1) Spin through within 6 turns. 2) Finish stalling CD here. You want to leave here after 6-7 turns depending on whether you have dragonware on Scrooge. Turn on Medea to move on. 2stars, no revive. On the 50 fire shield just use ur hiei a few times to get the shield to under 10 then just spin ghroth for the kill. Yog and whatever on the last stage which u can tank anyhow. Other stages i literally grind or use hiei prior to transform to kill and that was enough. I am the only guy with this clear on my leaderboard. Used natsu for fire but use piasa to grind also. Medea is worthless. If you're running a Natsu grind team with Piasa then sure, Medea isn't helpful. As you can see from my clear above, I didn't switch Medea off after turning her on. If I hadn't messed up my active skills and also done a better job with DC (i.e. if you're actually good at this game) the boss would have been an easy 1-shot kill. R3a - use Rose to remove earth. R5a - Alternate between using Hiei conversion and healing with heart (make sure to spin dark to maintain Ubume). Yog's conversion can be used for emergency hearts. When Rose will convert enough to hit the 50 rune total, use Rose, Felix to kill. R5b - Mukuro to remove some weathered runes, Hiei convert, whatever else is available.